Is Moz Domain Authority Important for SEO? 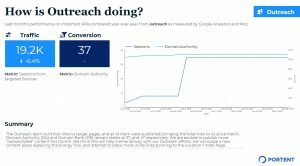 Authority and rank metrics like Moz Domain Authority can be incredibly useful for all of your SEO campaigns but when taken at face value or misinterpreted, these metrics can lead you astray of important goals and leave you chasing ROI shadows. The point of any ranking or authority metric is to mimic a search engine ranking algorithm. Companies like Moz have invested heavily and built these calculations on the backs of crawlers that index pages, count links, evaluate topicality, and use machine learning to provide insights into how well your website might rank against a competitor. There are quite a few ranking metrics on the market today. Some of the more well-known ones include Majestic’s Trust Flow and Citation Flow, Ahrefs’ Domain Rating, and Moz’s Domain Authority. Let’s dive into one of the most used authority metrics out there: Moz Domain Authority. What is Moz Domain Authority? The Moz Domain Authority, or DA, is a proprietary metric that attempts to predict how well your website will rank on a scale of 1-100. DA is a good indicator of a website’s potential for organic visibility. Moz also calculates the Page Authority (PA) for a specific URL, scoring it the same way that it does for the domain as a whole. You can quickly check your DA with the MozBar Chrome extension. MozBar comes in a few different flavors. The default view gives you DA scores and linking breakdowns for all the pages in a search results page, or once you click through to a page, the DA score and analysis for that page. A lighter, more simplified view is the DA mode which only shows the score of the page you’re on in the extension icon. What Does Moz DA Measure? Moz DA measures links: links, links, and more links. The Moz score measures inbound links from other sites to your specific pages, inbound links to any of your sub-domains, and inbound links to anywhere on your root domain. It also adds up the number of unique domains and the total quantity of links pointing at your site. Moz is taking all of the link data from their Link Explorer tool for a given website and matching that up against other domains in their index. Did you see the catch there? The score is based only on the Moz index of the web, not Google’s or anyone else’s. Their metric is only as good as its index, which got a lot better last year when Link Explorer replaced Open Site Explorer (OSE), increasing the size of their index 35x and the freshness of their index 30x. You may have heard recently about a shake-up with Domain Authority. Moz overhauled the way that they were calculating DA, and marketers and webmasters went into a tizzy. Some sites’ scores went up while others’ went down. The most important thing to know is that Domain Authority got better. The size of Moz’s link data set got bigger and fresher while they worked in ways to better interpret the link data by incorporating their Spam Score and adding a dash of machine-learning. So, if you were closely monitoring your Domain Authority scores and they went up on or around March 5, 2019, keep doing what you’re doing. Maybe even more of it. If your DA dropped off a cliff, you weren’t penalized — it was because your links stink. Moz got significantly better at assessing the quality of the inbound links pointing at your website, and their DA is now a more accurate reflection of Google’s algorithm. I recommend conducting a little backlink audit and updating that disavow file as soon as you get the chance. Is Domain Authority a Ranking Factor? Domain Authority is not a Google ranking factor. DA is a Moz metric. Google doesn’t use it. Bing doesn’t use it. DuckDuckGo doesn’t use it. How Should You Use Domain Authority? Domain Authority and similar authority and ranking scores are great as a comparative metric. They should never be used as an absolute measurement of how well your website is doing in organic search. Keep a close eye on your scores and your competitors’ scores over time, especially when there are coordinated campaigns with dedicated outreach efforts. If you have a link building campaign running alongside on-page optimizations of sections of your website, you’ll be able to show the correlation between on- and off-page factors driving in high-quality traffic. Then, add DA over time to a reporting dashboard that highlights all the traffic being driven to your campaign’s target pages. Moz Domain Authority should only be used as a part of your overall tracking strategy; it should never be the sole measurement. And after the 2.0 refresh, it is one of the best reflections of how Google might be analyzing and ranking your website. As long as you know how to use it (and how not to use it), DA will be a reliable indicator of how well you will perform against your competitors in the SERPs. The post Is Moz Domain Authority Important for SEO? appeared first on Portent.